Nothing to worry about or anything but we’re just conducting a teensy weensy investigation into your tax. Anything you wanna tell us? As I lay awake worrying, I had the most fantastic idea. Ok, maybe I couldn’t make a Wonka Bar costume like last time I had insomnia. But, just by chance, I happened to have all the ingredients for a life-size parrot costume for Sami. Would that do the trick and help me put my worries aside? I decided to give it a go. Four happy early morning hours of sticking and sewing (and swearing) flew by and the costume took shape. But, what also happened during my art and craft marathon, apart from make an unholy mess all over the kitchen, was my mind processed the whole tax thang. By the time I’d sorted out the costume, I’d also found a fantastic solution to the bigger problem too. I sat at my desk and wrote a calm, clear-headed reply to the Tax Man explaining the situation in full. Then I went back to bed, for some calm, clear-headed rest. Job done, problems resolved and sleep regained. Doesn’t come any better than that, does it? Thank you for your letter regarding the tax investigation. 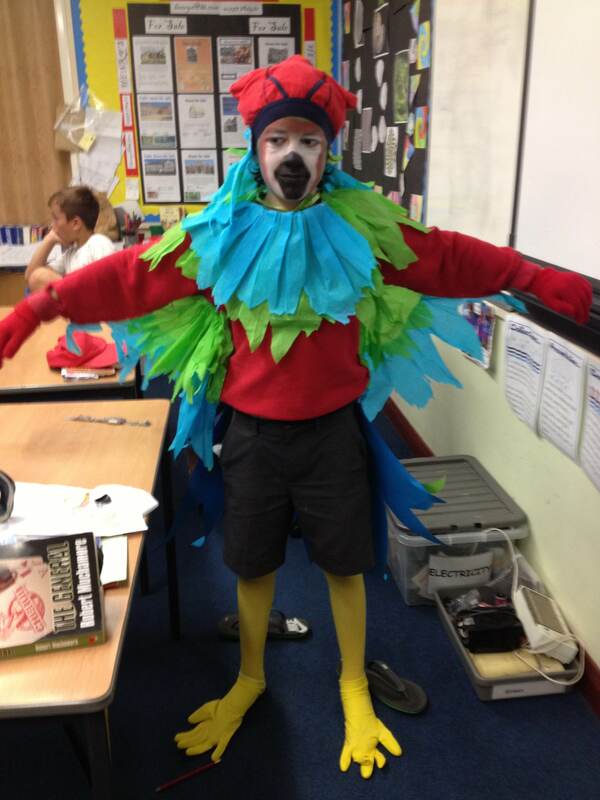 Please find enclosed some photos of the parrot costume I made in response to your letter. The receipts I’m missing form part of the wings and some of the elaborate tail-feather detail. Obviously, none have been included in the head or legs. I hope that settles this matter to your full satisfaction. Feel free not to contact me ever again. He loved it; wore it everywhere.